These HUUB Alpha Buoyancy Shorts are a perfect choice for all swimmers seeking increased core stability during their pool training sessions without the need for a pull buoy. Made from high grade neoprene, these unisex shorts have been constructed using HUUB's innovative X-O Skeleton™ for superior body alignment and stroke efficiency to greatly improve your training and swim times. 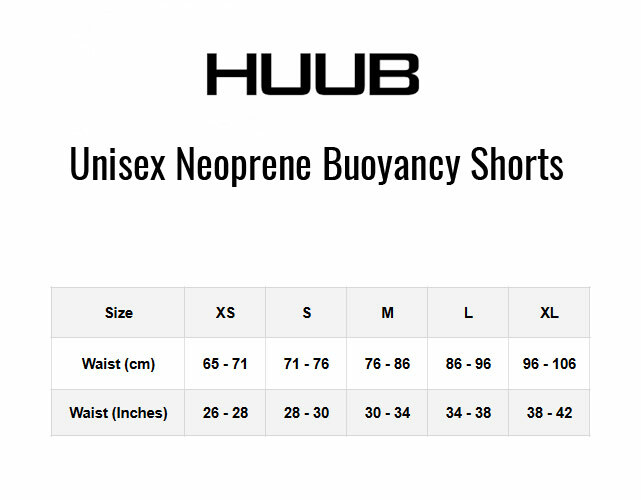 These unisex HUUB Alpha Buoyancy Shorts are an extremely popular training choice among both open water and pool swimmers. Made from high grade neoprene using HUUB's innovative X-O Skeleton™ construction, they have been designed as a kick and body alignment training tool. By providing buoyancy for the hips and lower body, these shorts promote a better position in the water to help you focus on your upper body and stroke technique. You'll also train your body to swim in a more streamlined shape. Designed with input from Paul Newsome and Swim Smooth, the HUUB Alpha increases core stability and assists hip rotation for improved pool training and swim times. Open water swimmers and triathletes love these neoprene shorts because they closely mimic the buoyant effects of a wetsuit on the hips and lower body. But pool swimmers also find them an extremely useful training aid, because they perform a similar job to a pull buoy but without the need to grip anything between your legs.